Direct donations – please use the ‘Support Us’ button on the left hand side of this page to make a donation via give.net. This is a fully secure process that will protect your personal information to the highest standards. Online Donors have the opportunity to register their gift for Gift Aid tax refunds, and you may also elect to give regular donations via Direct Debit using this system – more details are available when you go through the donation process. If you would like to make an enquiry about supporting us in any of these ways (or any other way!) please complete the General Enquiry form to let us know what you are doing or for any advice and help. If you would like to support us but you do not wish to use the online donation facility then please send your donation to: The Administrator The Light House 1A Argyll Street COVENTRY, CV2 4FJ All donations may be Gift Aided to get additional revenue via the Government Tax system – please enquire for details before sending your gift. Thank you for your interest and support! You can also support our work by shopping online via our new shopping channel, Give As You Live – Hundreds of stores will give us a donation if you shop via this page. 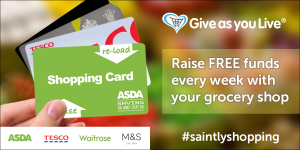 You can even donate to us by shopping at your local supermarket! Click below to find out more.